Five days of ski show in a country deprived of the blessing of mountains! 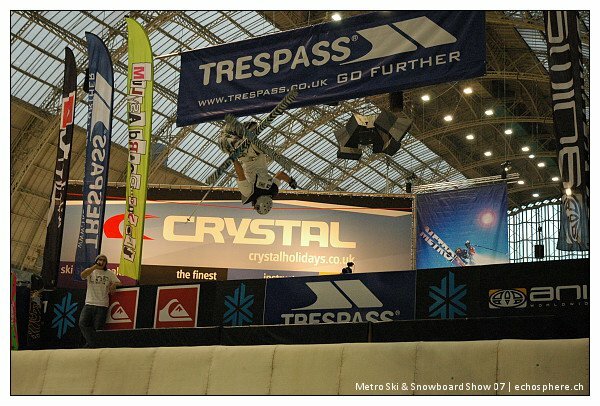 The Metro Ski and Snowboard Show is held every year in October in the capital of the UK. This is the Mecca for the British ski and snowboard industry. Over the course of five days, almost every snow sport fanatic on the Island passes through the gates of the Kensington Olympia stadium, along with many top European freeskiers and snowboarders. 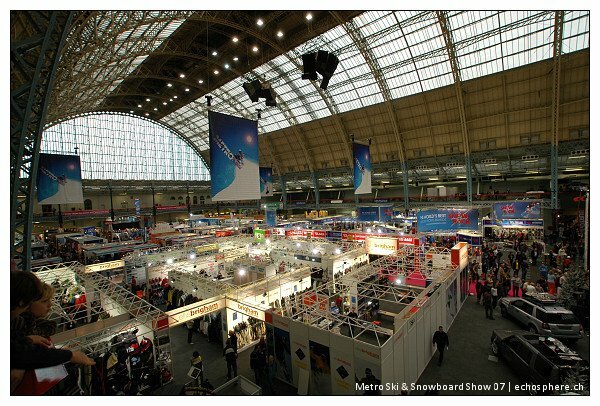 An overview of the main hall of the Metro Ski &amp; Snowboard show. Photo: Oliver Maccabez. Another angle of the overview. Photo: Oliver Maccabez. The show hosts various exhibitors ranging from ski resorts to Irish whisky distillers. Ski resorts and travel agents showed up in great numbers this year. You can see about booking your vacation in Tirol, France, Italy or even Whistler and then go to the Easyjet or Lastminute.com stand to book a flight to get there. The friendly help at Lastminute.com. Photo: Oliver Maccabez. The variety of locations is really amazing; while most of the destinations advertising themselves are based in Europe â€“ France, Italy with a stylish classical lounge as a display, Switzerland, Norway amongst others â€“ you can also visit exhibits for Whistler, Ski Utah or even Japan. However, the stands are usually quite small, since a company selling services doesnâ€™t really have a lot of products to display, but leaves a lot of room for booth sharing and the expansion of the choice. 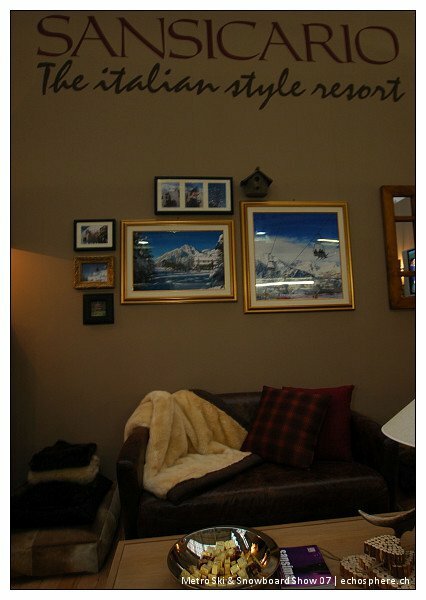 A stylish lounge to advertise an Italian ski resort. We didnâ€™t even have time to try the sofas thereâ€¦ Photo: CÃ©dric DÃ¶rig. Next to the many resorts, there are also quite a few stores present, selling gear to anyone who can afford it â€“ who are quite numerous actually. They range from the smallest 19.5 square-footed space crammed from top to bottom with eyewear, to two huge retail chains sharing a quarter of the total surface between them. You can buy everything you need for your vacation in the ski resort you just booked. From the skis and the matching boots and poles to the bag to carry them, passing by your full clothing gear, eyewear, full body protection and of course the Da Kine 60/40 convertible to store it all safely during the flight. Itâ€™s always funny to see the Brits leave the show and take the Tube â€“ they call the Underground here â€“ with huge plastic bags filled with equipment. 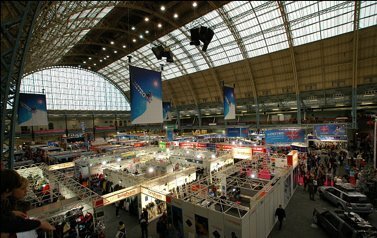 With all this, the Metro Ski &amp; Snowboard show and the exhibitors offer many attractions to the public. Although the sport doesnâ€™t have much in common with the pleasures of snow, you may try your skills on the self-rotating rock-climbing wall. 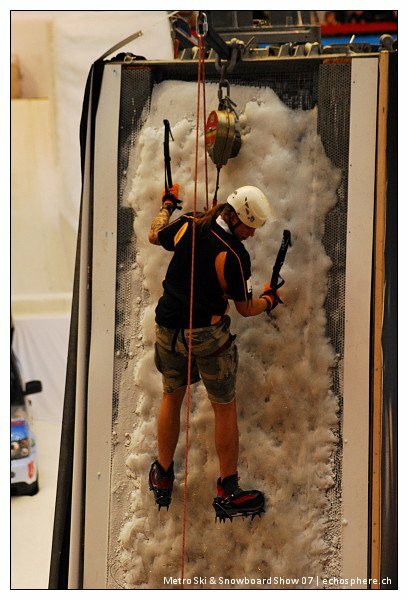 Once youâ€™ve mastered it you can move up a notch to the ice climbing wall with the appropriate equipment, with real ice â€“ the only real frozen material at the show next to the ice cream and snow cones being sold at the food stands â€“ frozen onto a metal grid. The ice climbing wall with three faces for maximum space optimization. Photo: Oliver Maccabez. Just donâ€™t try using the ice axe to get on top of the snowflex â€“ a synthetic snow replacement â€“ covered end run of the quarterpipe. Once youâ€™re done enjoying this, and provided you didnâ€™t stick your tongue on the ice at the top of the wall just to see what it tastes like, you can check out the sled dog exhibit at the Quebec stand to please your kids. After youâ€™ve taken the necessary souvenir pictures that you will show the kids on their eighteenth birthday and while youâ€™re waiting for them to begin wanting to leave, you may just turn around a bit in order to see the Tamil guy making a penguin out of a fresh block of ice using his many power tools. 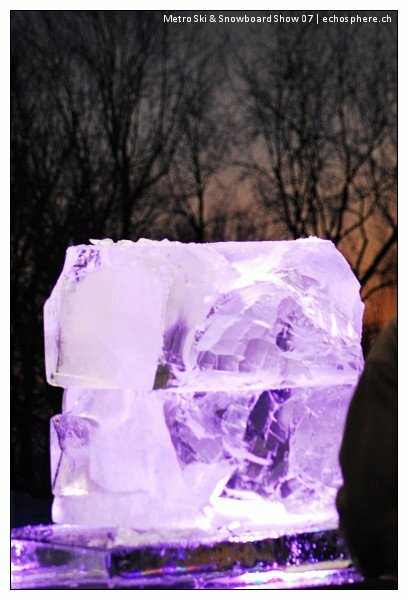 One of the ice sculptures in its raw form. Photo: Oliver Maccabez. However, there is one very crucial attraction that a â€œbasic&quot; visitor cannot enjoy. I am talking about the Ridersâ€™ Retreat, a safe haven for the skiers and many cool people with a badge hanging from their neck. This is provided courtesy of Oakley and Perruche, working together for everyoneâ€™s benefit. Here you can enjoy a nice cold beer while meeting many new interesting people. The inside of the trailer used as a main base is completely redesigned, complete with an Xbox 360 and DVD player for everyoneâ€™s enjoyment. The show is also the host for a few events of the British snow sport scene, which brings us to our main point. Burton, in partnership with Land Rover, has set up a rail jam where the box actually begins on top of a Land Rover SUV. Demo shows take place four times a day and usually last about fifteen minutes to half an hour. Once youâ€™re done watching you can turn around to face the big quarter pipe and enjoy half an hour of ski and snowboard demos. Both of these structures are built with snowflex, the local snow replacement. Looking at it from up close, it looks a lot like your average toothbrush only spread over a huge surface. One might actually also think of some types of fake lawn painted white. As you may already suspect, the gliding properties of this material are not phenomenal. This was compensated to some level by spraying it heavily with a silicon compound. Some riders even sprayed their skis or boards before hitting the slope. This surface also has a soft mattress-like feel when standing on it. This is because falls are already bringing some heavy burn marks with them, so no need to add broken bones caused by hitting a hard floor. The Brits use this surface to train during the summer and pre-season before taking their skis to continental Europe to get to where the real snow is. 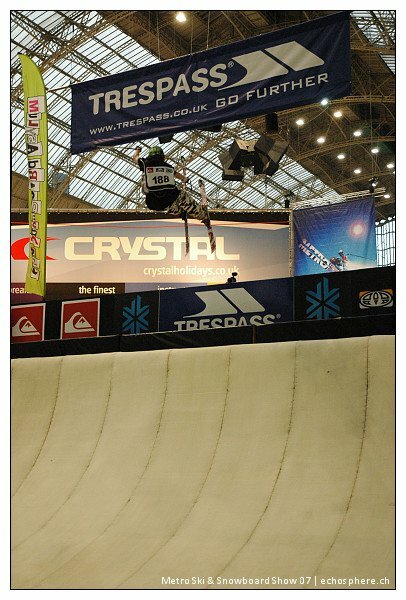 The quarter pipe plaed host to the British Invitational, a competition part of the British Snow Tour. 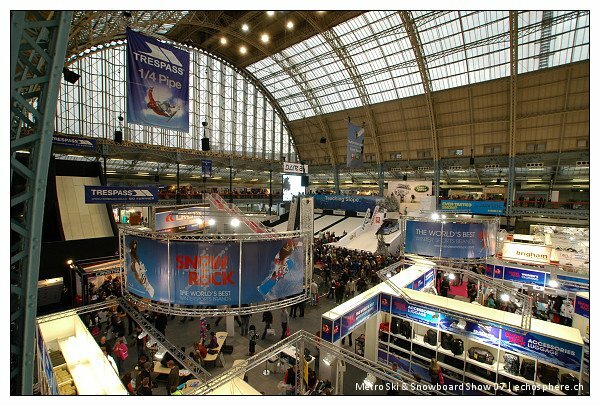 The concept of the tour is to vary the surfaces and location with some of the competitions taking place on snowflex indoors in the UK, on real snow also in the UK and also in the Alps for some good old fresh mountain air. 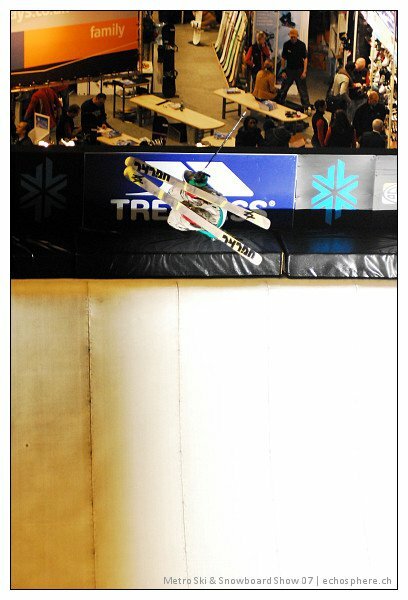 The event taking place at the Metro Ski &amp; Snowboard show is the British Invitational Quarter Pipe Championship. A champion in ski and snowboard is crowned at the end of the event. 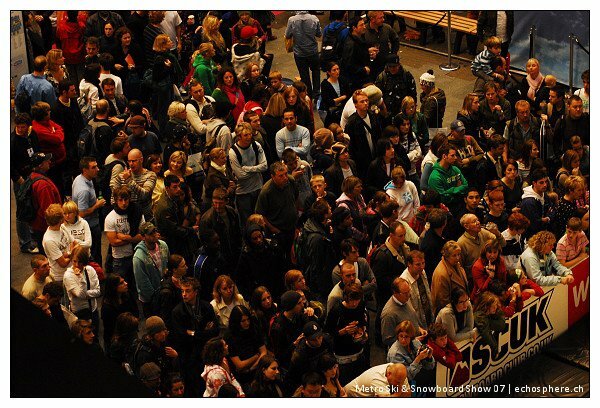 The crowd is getting ready to watch some serious action inside the Kensington Olympia Stadium of London. Photo: CÃ©dric DÃ¶rig. James Woods showing how high you can go even when youâ€™re riding on an artificial surface. Photo: Oliver Maccabez. The structure of the whole thing is actually quite straight forward, with a qualifying round with two runs per rider and the best run being scored, a final based on the same system and a superfinal with the top three riders of each sport doing one last run to convince the judges of why they should win. The Prize is a trip to the BRITS 08, a week of partying and skiing topped off with a competition. One of the Brits giving a pre-taste of what other European riders will be going up against later on. Photo: CÃ©dric DÃ¶rig. Getting along quite well without the luxury of real snow, the top riders in the UK, Paddy Graham, Mike Wakefield, Andy Bennett and many more battled it out with some very high level tricks. After the 540s during warm-up the skiers moved on to bigger and more important things such as some flat 7s and even some 9s which are quite rare on a snowflex quarter. The public was also able to enjoy a few back and frontflips, always a good way to impress. The judges, however, were really impressed with Mike Wakefieldâ€™s landmark trick, the wakeâ€™n bake. Mike pops out off the nose in the quarter pipe and he does a front 180 flip with a sick 90Â° angle mute. This apparently still does the trick for him, after he won last yearsâ€™ London Ride with it. On the snowboard front, it was Ben Knox who won the title. Mike Wakefieldâ€™s famous Wake â€˜n Bakeâ€¦ Photo: Oliver Maccabez. 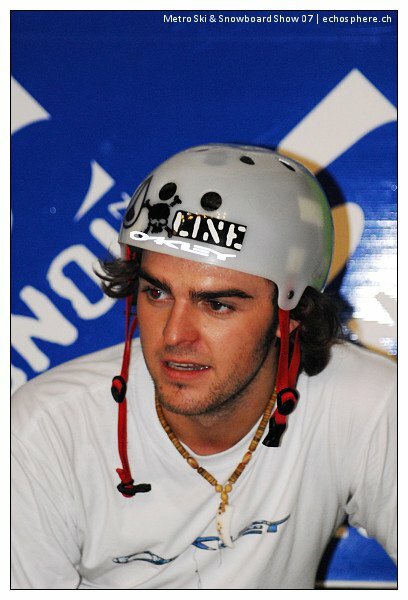 Mike Wakefield, winner of the 2007 British Invitational Quarter Pipe Championships. Photo: CÃ©dric DÃ¶rig. The London Ride is the next event we will be covering for you. Stay tuned for more in a few days. Until then be sure to check the videos with a short highlight of the show and the competition as well as an interview with Stewart Morgan, team manager from Oakley in the UK, and Mike Wakefield, the winner of this yearsâ€™ British invitational Quarter Pipe Championships.